Morpheus Tassis May 28, 2016 February 21, 2017 Comments Off on The Creative Economy International Event was a resounding success! 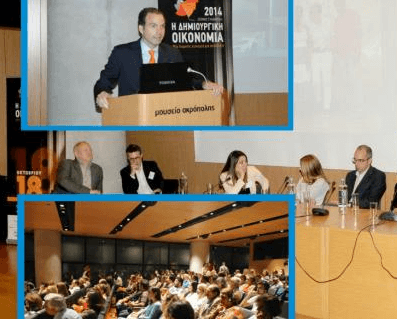 The international event, “The Creative Economy – An Infinite Opportunity for Growth,” which was organized by ELPIS Philanthropy Advisors, successfully took place on Saturday, October 18th at the Acropolis Museum in Athens, Greece. The goal of this international Event was not only to encourage and define the Creative Industries in Greece, but also to emphasize the important role creative professions play not only in the country’s Creative Economy but also in its general social advancement. More than twenty internationally acclaimed experts in the Creative Economy field participated in the Event through presentations, interviews, roundtable discussions as well as with audience Q & A’s. Among them were, Lord Chris Smith, the President of the U.K. Environment Agency and a visiting professor in culture and the creative industries at the University of the Arts London; Felipe Buitrago Restrepo, economist and co-author of, “The Orange Economy – An Infinite Opportunity;” Andrew Senior, a specialist in matters of creative entrepreneurship and intellectual property; Prof. Stuart MacDonald, design and innovation specialist; and Norman Palmer, Barrister and Professor Emeritus of the Law of Art and Cultural Property at University College London. Audience attendance was impressive, while the Event was also live-streamed. Online viewers tuned in not only from Greece, but also from Belgium, Ireland, England, the U.S.A., France, Germany, Cyprus, Bulgaria, Peru, Botswana, Colombia and Sweden. Some of the most important suggestions to take away from the Event concern the drastic need to chart all creative professions that pertain to the Creative Industries in Greece; the need of cooperation between the state, the private sector and the professionals in the field; and that in order for innovations to be supported, strong and effective institutions have to be created. The importance to continue this dialogue was clearly encouraged by all speakers. As was the hope that this International Event will propel them from the stage of defining and discussing, to strategic planning and the implementation of effective policies for all matters concerning the Creative Economy in Greece.